Under a blazing sun, a forest of metal towers shimmer. The constant rumble of heavy machinery fills the air, as clouds of dust are kicked up by bulldozers and big trucks. 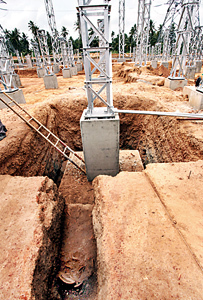 When it’s complete, the New Chilaw Grid Substation currently under construction will supply the island’s North Western Province with an estimated 450MW of power. In the hands of Chinese contractors, work was proceeding at a tremendous pace but lately something has happened to slow them down. While digging deep to set the foundation of one of the towers, they’ve unearthed several ancient graves. The bodies in them are but ashes and only fragments of pottery remain. 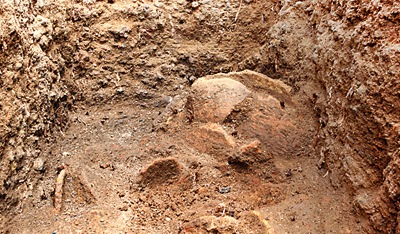 As Deputy Director Dr. Nimal Perera and his team at the Department of Archaeology rush to save what they can, the New Chilaw Grid Substation has just become one of the most unusual archaeological digs in Sri Lanka. It was in the first week of June that Saman Wijesinghe noticed something odd while walking around the site – mixed in with the soil that had been dug up were distinctive fragments of black and red pottery as well as fine dust that was obviously ash. Of all the people on site that day, the project’s Electrical Superintendent was best equipped to understand what he was seeing. Dr. Perera and his team responded the same day. Dotted around the property, three graves were clearly identified. They are thin and long, their edges bordered with a distinctive red soil. The red is the indicator that these aren’t graves so much as cremation pits. The deep trenches were cut through hard soil and the walls plastered with mud. Firewood was laid, and then the body placed on top of it. To honour their dead, their loved ones probably placed pottery and other elements around them before setting the firewood alight. The heat from the flames baked the soil around, creating that red frame around the edges of the pit. Within the pits themselves, three distinct layers of charcoal, ash and pottery lead Dr. Perera to speculate that the sites were used multiple times, becoming the final resting place of more than one person. Their excavations have unearthed the bones of a small bird. “In the presence of bones of the birds, we think there was some kind of ritual,” says Dr. Perera. With a small tributary of the Kadupitioya running adjacent to the property, the archaeologists believe this spot would likely have been one where a small community thrived. They would have had tools and domesticated animals, but were unlikely to have developed writing as yet. While carbon samples are still being taken Dr. Perera makes an educated guess that these graves could date back to the Proto-historic Iron Age (dating back to 1000BC) and the early years of the Iron Age itself. Part of the excavated grave. Part of his reasoning is in the form of the graves themselves. The laterite soil is hard and the pits are deep – these required tools to dig, he says. Today, the site is particularly busy. It’s time to take some samples. Dr. T.R Premathilake is a senior lecturer at the Post Graduate Institute of Archaeology and a paleo-ecologist. Over the coming months, he will carefully analyse the samples he takes from here, looking for pollen, seeds, charcoal and fossilized remains of any matter that could help him reconstruct what the ecosystem around was like when these graves were first dug. “I want to understand the environment at that time,” says Dr. Premathilake explaining that he’ll be looking not just for the everyday but the exotic – the latter will reveal whether this community had ties with others farther away and incorporated foreign plants and flowers into their death rituals. While explaining that knowing the age of the graves will help him put his findings in context, he says he’s concerned by the coconut roots that have speared through the soil. Describing such “bioturbation” or root contamination as very problematic, he says it can make it difficult to get an accurate fix on the age of the samples. The coconut roots left over from the estate that once stood here are not the archaeologists’ only problems. While the CEB has been supportive and has even allotted funds to the project, construction is still powering on and the grid substation will be complete in a matter of months. 60% of one grave is intact, its edges sheared away and ending in a deep pit where a steel tower is planted. The other is all but destroyed. While they want to see what they can find in these two, Dr. Perera says they are keeping the third site intact for “archaeologists of the future” who he hopes will be able to explore the site with better tools at their disposal. In the months to come, they will keep exploring the site and hope to find more human remains such as bones or teeth as well as tools or other ritual elements that may have been consigned to the cremation pits with the bodies. Standing by an ancient grave and dwarfed by the steep pylons towering above him Dr. Perera says: “This is really a Sri Lankan speciality. This site is unique to Sri Lanka.” Now they will simply have to do what they can and formulate a way in which ancient and modern can co-exist.